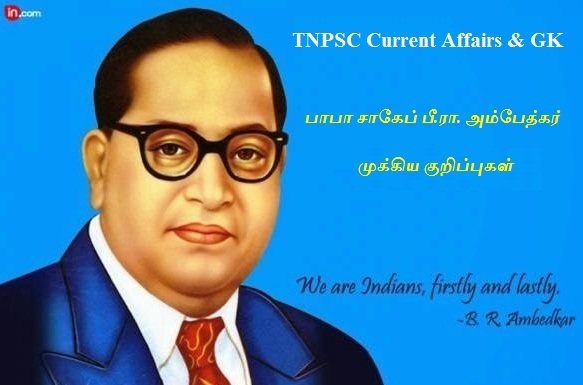 TNPSC Current Affairs and GK Today: Baba Saheb B. R. Ambedkar Birth Day Notes in Tamil April 14, 2017. Notes in Tamil Language for TNPSC, TRB, TET, TN POLICE, UPSC, RRB and Other Government Competitive Examinations. Bhimrao Ramji Ambedkar (14 April 1891 – 06 December 1956), popularly known as Baba Saheb, was Independent India's first law minister and the principal architect of the Constitution of India. and he was an Indian jurist, economist, politician and social reformer who inspired the Dalit Buddhist Movement and campaigned against social discrimination against Untouchables (Dalits), while also supporting the rights of women and labour.